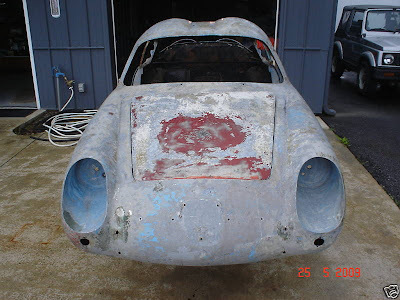 It seems like you just can't go on eBay these days without tripping over a rare old Italian car in need of restoration. This one is a 1961 Fiat Abarth Zagato "Double Bubble". The Fiat Abarth Zagato sat on a Fiat 600 platform. With the beautiful lightweight alloy Zagato body and the Abarth massaged engine, these cars were capable of speeds in excess of 100 MPH. They were incredibly successful competition cars. The car being offered on eBay has some racing history. Apart and in need of complete restoration, the seller states this car is missing a bumperette, the grill wings and a door panel. The seller also notes that it has a broken windshield and the chrome will need replating. The floors need to be replaced. The engine is not the original and has been replaced by a later one. Not a job for the faint hearted and / or anyone with a tight budget, but if you have the resources, this would make a great show car or vintage racer. Click here to see a brief history of Carlo Abarth and his Fiat based cars. Click here for the Zagato website. It has a great "history" section where you can check out all the great Zagato designed cars.